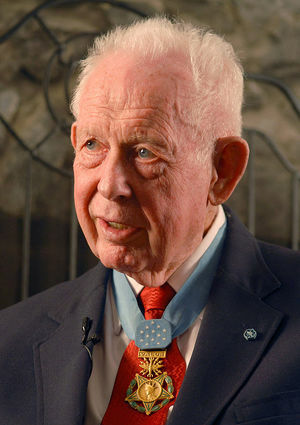 Major Fisher led a small squadron of planes that had been sent to help Special Forces commandos who were under attack that day at an isolated camp near the South Vietnam-Laos border, according to the Air Force. While they were strafing North Vietnamese positions, a shell destroyed the engine of one plane, forcing the pilot to crash-land. Major Fisher saw the plane skid and burst into flames and the pilot, Maj. Dafford Myers, leap from the wreckage and disappear into the underbrush. He radioed for a helicopter, then decided there was not enough time, telling radio controllers he would get Major Myers himself. Landing for the rescue, Major Fisher overshot the runway, damaging the tail section of his plane. He had just turned the plane around to begin his search when Major Myers sprinted into view. Major Fisher pulled him into the cockpit headfirst, and they took off. “We didn’t even strap in,” he said. He was often asked why he took the risk, landing on an airstrip littered with debris and surrounded by hills bristling with guns. He barely knew Major Myers; they were from different units and had met only two or three times. He had the same answer most times: A comrade in arms was about to be killed, and he believed he could save him. “It’s important that you respond to your feelings when the time comes for it,” he said in 2011. Fisher was born on January 11, 1927, in San Bernardino, California. His father had moved the family there during the Depression to find work. He then moved his family back to Utah and Fisher was reared in Clearfield, Utah. He served in the Navy for a brief time during World War II. He attended Boise State Junior College in 1947 and the University of Utah in 1949. During this time he was a member of the Air National Guard. He was commissioned into the Air Force in 1951, stalling the completion of his bachelor’s degree. After his training as a pilot, he was a jet fighter pilot in the Air Defense Command until 1965. He volunteered for duty in Vietnam and served from July 1965 until June 1966. He flew over 200 combat missions as a member of the 1st Air Commando Squadron. After the war, Fisher returned to the Air Defense Command and flew jet interceptors until he retired as a colonel in 1974. He and his wife, Realla, raised seed corn and alfalfa on their farm in Kuna, Idaho, and were the parents of six sons. He also grew fruit trees and kept bees. In 1981, he ran unsuccessfully for governor of the state of Idaho. On May 3, 2008, Fisher received his diploma from the University of Utah, 57 years after attending classes. He was officially recognized for his past academic achievements and decorated military career. The Boise Rescue Mission started a homeless veterans transitional living program in 2010. With permission from Col. Fisher, the Motto of the program is Colonel Fisher's famous quote after he rescued his comrade: "When a man is down, you don't leave him there.” The statement is on the wall of the entrance to the living quarters of the River of Life Mission in Boise. He died on August 16, 2014. He was a lifelong member of The Church of Jesus Christ of Latter-day Saints. This page was last edited on 26 May 2015, at 15:26.